Samsung Pay is an application for Samsung phones which comes preinstalled in your smartphone when you purchase it. It allows using your smartphone as a bank card for making different payments very conveniently. But sometimes you may not need this application and want it permanently removed from your device. But since it is pre-installed in almost all latest Samsung smartphones, you may need to follow a slightly different procedure to uninstall it altogether. 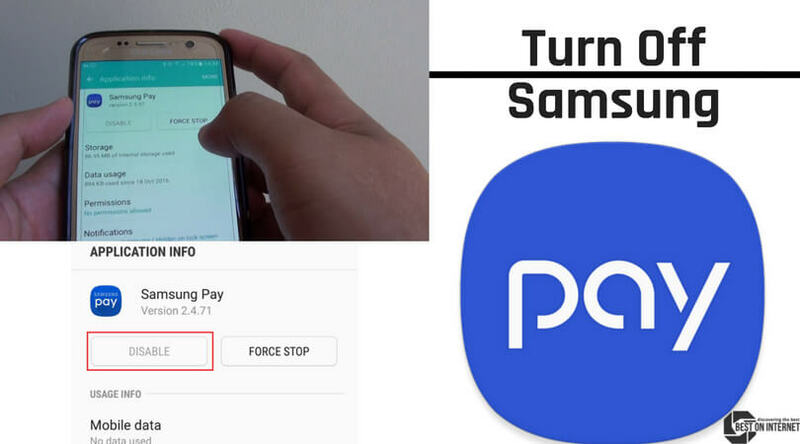 If you are wondering how to delete Samsung Pay, there are many ways in which you can do so, and 3 of the most widely used practical methods are listed below. It is quite easy to just delete the bank card from the app if you do not want to use it. You can have a view of all the cards which you have by tapping on the credit/debit side in your Samsung pay. By clicking on the card you can even check its details. The steps to follow while removing a card which you do not want to be used are as follows. First, open you Samsung pay application. Click on the credit/debit tab. Choose the card which you want to cease, then click on it. The details regarding that card would appear. Then there is an overflow icon which is in a kind of three vertical dots situated at the upper right corner. Click on it and select delete to remove that card. You also need to give a reason for deleting it. This method will practically. Repeat this for all your cards until your Samsung App becomes useless even with its existence. This situation mostly occurs when you are done with something. There are two ways to uninstall the Samsung pay application. You just need to press the Samsung pay app icon which is present on your home screen, and immediately a pop-up dialogue box appears. Select delete from it and Voila! Your app is gone in a jiffy. Another way is to uninstall this app through your phone settings. Go to your setting and select apps option to move to the application manager. Click on application manager, search Samsung pay. Click on it and then tap on uninstall. Before the app is deleted, it will ask for your confirmation. Press OK to confirm and uninstall Samsung Pay. Titanium app is a great backup option if you are looking to discard Samsung Pay from your phone. Not just Samsung Pay, Titanium backup works wonders if you are looking to uninstall any kind of downloaded or pre-installed apps on your phone. However, there are some limitations related to this app too. It is very helpful if your device is rooted. You just need to download and install this app from google play store and run it. Open the application and move to the list of apps. From that list, click on Samsung pay and tap on uninstall Samsung Pay. Confirm it by pressing OK.
Samsung pay helps in paying for items that you purchase in an easy manner. People may forget their wallets, but not their smartphones. Therefore, this app works wonders in making cashless payments. However, given its certain shortcomings, Samsung Pay isn’t going down well with its customers. People are moving onto better and more convenient methods of making cashless payments. Also, Samsung Pay does not support all banks. So people are not recommending it due to its limitations. Even though that it comes pre-installed on Samsung phones, it is easy to install as well as to uninstall it.